CAY 10465 is a selective and high-affinity AhR agonist, with a Ki of 0.2 nM, and shows no effect on estrogen receptor (Ki >100000 nM). 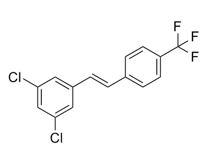 PDM2 is a selective, high-affinity aryl hydrocarbon receptor (AhR) antagonist with an Ki of 1.2±0.4 nM. beta-Naphthoflavone is a AhR agonist and antioxidant. UM729 is an enhancer of AhR antagonists. 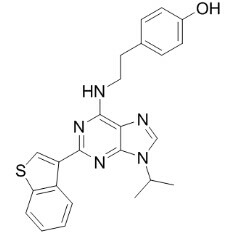 CH-223191 is a ligand-selective antagonist of the Ah (Dioxin) receptor. 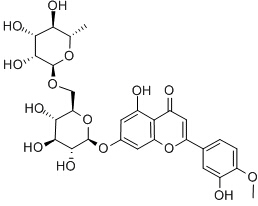 Diosmin is a semisynthetic phlebotropic agent and a member of the flavonoid family. Kynurenine is a product of constitutive tryptophan catabolism via tryptophan-2,3-dioxygenase in the liver and human gliomas that is associated with the suppression of antitumor immune responses. At 100 μM, kynurenine inhibits allogeneic T-cell proliferation and increases malignant U87 glioma cell invasion into a collagen matrix.Kynurenine activates the aryl hydrocarbon receptor (AhR) target gene CYP1A1 with an EC50 value of 12.3 μM and binds to AhR with an apparent Kd value of ~4 μM.1 Kynurenine is ultimately metabolized to quinolinic acid, a potent neurotoxin that acts as an NMDA agonist and has been described to be involved in neurodegenerative processes in the brain. 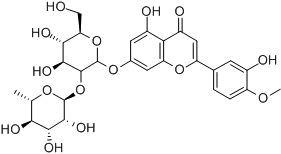 Indole-3-carbinol suppresses NF-κB activity and also is an Aryl hydrocarbon receptor (AhR) agonist. The compound StemRegenin 1 (SR1) is a selective, cell permeable, small molecule that promotes the self-renewal of human hematopoietic stem cells in culture.